Hey, let’s not talk about me for a minute. I’m reading Land of Ash right now. It’s an anthology of short stories by David Dalglish, David McAfee, Daniel Arenson, John Fitch V, Michael Crane, and Robert Duperre. The premise is simple: The Yellowstone Caldera erupts, covering the world in ash, and that’s the unifying theme between the eleven different stories. It’s all about survivors, and how they deal with total devastation in a land covered in ash. I read Full Dark, No Stars by Stephen King a few weeks back, and I like Land of Ash better. Not that I didn’t like Full Dark, No Stars – because I really did. King is a master of the underrated medium of short stories and novellas. But I still enjoy Land of Ash more. So far, my favorite is “Shelter” by David Dalglish. It’s about a father and his small child holing themselves up in the house after the ash comes. There’s something so simple and bittersweet about it that’s perfect. That’s not to say there’s any bad stories in it – “Beach Puppies” is somewhat lighter than most of the other stories, and “Last Words” brings it down to a more personal level and less apocalyptic, if that makes sense. 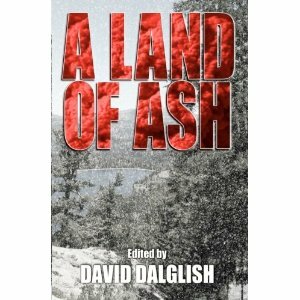 To buy Land of Ash, click: here. I also just read Lessons by Michael Crane. It’s actually because I read this that I started reading Land of Ash. I’d bout LoA right when it came out, but I hadn’t gotten around to reading it yet. Then I read a review about Lessons, and it piqued my interest. Anyway – Lessons is another anthology, but this time with 100-word flash fiction. I know what you’re thinking – stories in under a 100-words? That sounds ridiculous and unenjoyable. But you’re wrong. Dead wrong. They are morbid, but they’re fun and quick and perfect. If they were longer, they wouldn’t be as good. If you enjoy, Edward Gorey or Tim Burton, you need to check this book out. It’s that kitzchey fun thing that becomes as cult classic, because it doesn’t really have a genre or a niche. It stands alone, and for $.99, its completely worth it. I could see this as a paperback with fun illustrations being sold at Hot Topic and making an excellent holiday stocking stuffer. On the subject of that – hey, Mike, if you go to Createspace and make a paperback for Lessons, I’ll buy a bunch. I know some of my friends would like them, and I could give them away here on my ol’ blog. Because it’s awesome. So check out Lessons: here. Jenny Pox by J. L. Bryan – Probably my favorite book I’ve read all year. It is YA, but it has some adult situations. But it’s just really good. If you like YA paranormal, check this out. And even if you don’t, check it out. It’s that good. Glimpse by Stacey Wallace Benefiel – I’ve only read the first one so far, but Stacey’s fun. And she writes fun. It’s like hanging out with a friend from high school, when you were in high school, but without as much angst. Grubs by David McAfee – Still the only book that gave me nightmares. Also, he did the short story for Zombiepalooza, called “One of Four.” Which you should read: here, because I really enjoyed it. I think I’ve read it like ten times. American Psycho by Bret Easton Ellis. This book is not for everyone. In fact, it’s not for most people. I know that. But I love it sooo much. The Grand Design by Stephen Hawking. From the product description: “As we promise in our opening chapter, unlike the answer to the Ultimate Question of Life given in the Hitchhiker’s Guide to the Galaxy, the answer we provide in The Grand Design is not, simply, “42.”” That’s not entirely innaccurate. Space, time, the universe boggles my mind. I love reading about it. Hitchiker’s Guide to the Galaxy by Douglas Addams. This is my second time reading it, and I’m not all the way through, but it’s a good damn book. The Long Halloween and Hush by Jeph Loeb. Those are Batman graphic novels. I love, love, love Jeph Loeb, so much so I’m going to read Superman For All Seasons and I hate Superman. Don’t get me wrong – Alan Moore and Frank Miller are brilliant. But there’s something about Jeph Loeb that I adore. He tells great stories. Cat’s Cradle by Kurt Vonnegut. I read this book at least once a year for good reason. It’s incredible. Probably one of the best books of all time. Tulips and Chimneys by e e cummings. I don’t read books of poetry that often (aside from Sylvia Plath and Dylan Thomas) but e e cummings is one of the most gifted writers I’ve ever read. Go. Read. Him. And I do in fact use the word “awesome” too much. But trust me, when I say awesome, I mean it. You got in some great reading along with all that great writing. I couldn’t agree more with the Zellie Wells Series – you’ll love Glimmer :o] I am a big fan of Stacey’s and I’m looking forward to the next in the series! I read Land of Ash, too, actually, I’ve read a lot of what you read. David Dalglish did a great job with Shelter and the rest of the stories. David McAfee, he did Alone on the Mountain in LofA, is a brilliant writer, too, and his work is pretty gory in a good way–33 A.D. and Saying Goodbye to the Sun are 2 books I’ve read this year of his and I liked them both. He has a way with the macabre that really hits home. I read Jenny Pox and as Stacey said, Vonnegut obsession’s seem to abound for us all at one time or another, Cat’s Cradle is incredible and Slaughterhouse five, too. Grubs was an entirely creepy, horrific and I loved it. I haven’t read ‘One of Four’. Thanks for the link, I’ll check it out. Bret Easton Elis American Psycho! I read that book when it was so hard to find you practically had to smuggle it! That was one of the most brilliant, sickeningly morbid pieces of work I’ve ever read. You should give Robert McCammon’s Swan Song a try. One of my all time favorites, it’s almost 1000 pages. I read it the first time in 6th grade and I’ve read it at least 10 times since then. Thanks for sharing your reads! Get to Glimmer then try out Swan Song and let me know what you think of it. I actually bought Glimpse earlier today, with intentions to read it tonight. Sounds really good, so I’m excited. I absolutely loved Grubs…creepy, campy fun!I love the cover for Jenny Pox and will definitely have to check it out. I went through a serious Vonnegut obsession a few years back and it’s probably high time I read Cat’s Cradle again. I see all kinds o’reading material here that interests me. Thanks for the recommendations.